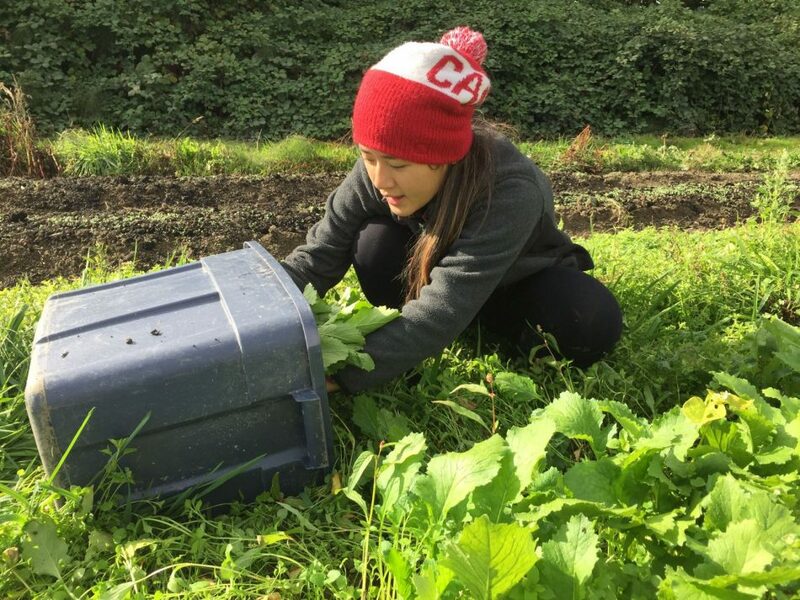 KPU Farm School graduate Caroline Chiu has been making sure that Vancouverites eat their greens by growing organic Chinese veggies on her farm in Richmond. Chiu moved to Hong Kong from Vancouver at a young age, and when she returned to the city 14 years ago, she noticed that it was difficult to find many of the veggies she enjoyed while growing up. “When I go to the farmers markets there aren’t any organic Chinese greens, so I just saw that as a gap,” she says. Two years ago, she leased a half-acre plot of KPU-owned land at 13840 Gilbert Road in Richmond, and Riverside Farm was born. She now grows a variety of organic Chinese produce including bok choy, gai lan, choy sum, gai choy, siu choy, pea tips, and tong ho. Chiu is currently working to strengthen the connection to Chinese culture in the Vancouver community through the food she produces. She also hopes to encourage more people in the city, particular young people, to get involved in farming. At the Kwantlen St. Farm Market, Chiu was often approached by Chinese customers who were eager to learn about the benefits of organic food and what she was offering. After selling produce at various markets in her first year at KPU’s Farm School, she entered the Community Supported Agriculture program with the hope of reaching more people from the Chinese community. The program provides customers with a $20 box of vegetables once a week for 15 weeks, and with 37 participants this season, virtually all her produce was accounted for. At least half of her customers were Chinese. While her hard work has been rewarding, it has not come without challenges. Farming is both physically and mentally demanding, and Chiu has had to accept that her summer months will be dedicated to caring for her land. In addition to caring for her produce, she must handle the added stress of ensuring that all of her customers receive their weekly box and that all of her equipment is functioning properly. “Things always break down on the farm. I could go to my farm one day and it’s flooding because my pipe broke or something, so there’s always that kind of worry,” she explains. Chiu began her studies at UBC, where she received a master’s degree in food and resource economics. She then volunteered on a farm in Pemberton for three weeks and decided to continue her agricultural education with KPU. The university’s nine-month farming program is designed for beginners, with additional classes that teach students about soil health, pest management, compost management, business planning, and beekeeping. “You learn the holistic system of farming and not just how to grow,” says Chiu. In addition to being the coordinator for KPU’s farming program, she is also the primary operator of Riverside Farm, where she and her business partner, fellow KPU graduate Jennifer Cline, will continue to grow healthy Chinese produce for their third season in the spring.